Our pressure transducer features better sensitivity and good accuracy, easy mounting and safe to use, works for oil, fuel, diesel, gas, water, air pressure, can be used in oil tank, gas tank, diesel tank etc. 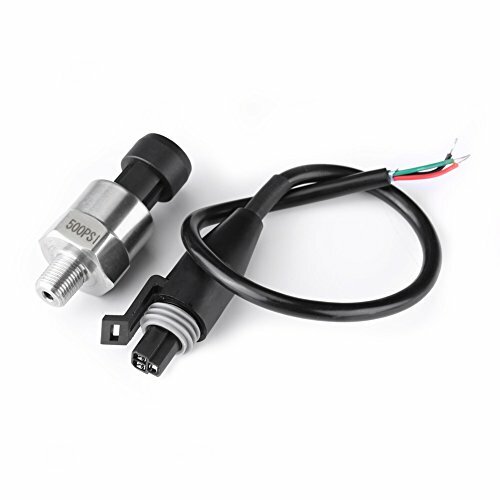 【BETTER SENSITIVITY】It's an advance pressure transducer than traditional mechanical pressure transducer. Our pressure transducer offers a better sensitivity. 【GOOD ACCURACY】Only ±2%FS small output error, including nonlinear, hysteresis error and repeatability, full temperature range. More accurate than similar products in the market. 【EASY MOUNTING】Our pressure gauge transducer features light weight and small size, convenient to install and operate. 【SURGE VOLTAGE PROTECTION】It has complete surge voltage protection function. More safe to use. 【WIDE COMPATIBILITY】Works for oil, fuel, diesel, gas, water, air pressure, can be used in oil tank, gas tank, diesel tank etc. View More In Transmission Oil Pressure.